2018- A Truly Eventful Year. Dear friends, co-workers and alumni! We at JCBT have experienced a year of abundant blessing in that we have had the privilege to be a blessing to many nations. We have had the opportunity to serve representatives of a great number of people groups. This is grace, especially when considering our limited staff and resources. We thank you for providing us with your friendship, fellowship and financial support! In common service, Halvor and Mirja Ronning, Co-Directors of JCBT. The following letter includes the description of the JCBT activities (with READ MORE click options for further information). The special high level workshop in Hebrew Psalms. Greetings from the Jerusalem Center for Bible Translators! “Praise the Lord all you gentiles! Laud Him, all you peoples! and the truth of the Lord endures forever! Praise the Lord!” (Psalm: 117: 1-2). gentile nations and people groups. In fact, there were 15 translators from 10 nations in the semester long JCBT/Hebrew university program. In addition there were 143 translators, consultants and CEOs from peoples in Africa, Central and South America, and Asia who have had the privilege of participating in the JCBT short term study tours which present the reality of the land as the context of the Biblical text. The 2018 student body consisted of 15 students from 10 different countries. The 5.5 months study program was very intensive. Much knowledge was gained in Biblical Hebrew (400 academic hours) and much learned about the context of the land (18 days study tours and 40 hours of lectures). A special additional blessing was the wonderful fellowship that developed among the students in spite of the variety of the backgrounds from South America, Africa, Russia, Mongolia and China. Mirja Ronning has been the director of the semester program. In 2018 there were altogether five study tours for translators, consultants and CEOs requested and supported by UBS. They are the result of an official MEMORANDUM OF UNDERSTANDING between JCBT and UBS in 2016. Since then, UBS has been sending 4-5 groups every year. Esteban Voth, Head of Global Translation Advisors, UBS, sets up the groups and Brian Kvasnica is the director of the short term courses at JCBT. There were two one- week study tours for CEOs who are each the director of translation work in their respective countries. The first was for directors in French speaking West Africa (February 11-17), including some 14 countries such as Senegal, Mali, Benin, Togo, and the Democratic Republic of Congo. The second CEO study tour was for 15 CEOs from 12 countries in Spanish speaking Central and South America (Oct.21-Oct. 27). The purpose was to let the CEOs experience the reality of the land of the Bible in order to enrich and motivate them in their work and cause them to encourage and support their national translators to come here for further studies. Note: almost all translations into mother tongues are translated with the involvement of nationals who have NO knowledge of Hebrew, but are helped largely by mostly foreign consultants, who have never been in the land of the Bible. 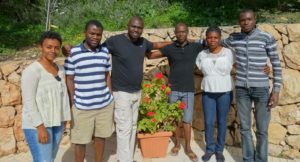 There were three two- week study tours: First were the translators of different languages from within Portuguese speaking Angola (July 15 – July 28). They were led by Riikka Halme-Berneking and Dinis Ezequiel, and guided by an Israeli Portuguese speaking local guide. 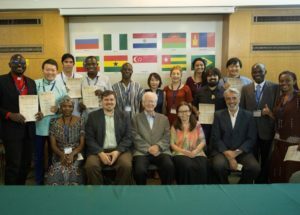 Right after them followed a course for Spanish speaking translators (July 29 – August 11); they came from variety of countries in Central and South America, and were mostly members of minority ethnic groups. The leader and main guide was Esteban Voth of Argentina. In August (Aug.5 – Sept.1) JCBT had the honor and joy to welcome once again participants of a special course for experienced consultants of the Greek NT; they now wish to learn the language of the Hebrew Bible in preparation for them to become the greatly needed translation consultants for projects in the Hebrew OT. The course was initiated by Bob Carter and Brian Migliazza of the Seed Company in 2017. This one month program provides an intensive course in Biblical Hebrew and OT exegesis; it has the abbreviated name of NT2OT. One of the most challenging yet fulfilling courses, was a special course sponsored by JCBT, for six minority language translators; they came from hostile animist and Muslim areas. There was a battle to get the visas. In the end, however, even without the required appointment, the visas were miraculously granted on the same day as the applications were submitted; this had never ever happened before. Furthermore, the confirmation came only two days before the participants’ scheduled flights! The result was that all of us, the translators and staff, felt that there may be bigger developments in stored with unique blessings to larger numbers of translators fron the Far east in the future. One of the translators summarized the course as “everything we learned here will be relevant to the task in hand”. We sent them back with our blessings and prayers for continuous protection – since they return to dangerous areas. The guide knew the major language of their country and was a great blessing to them. Studying One Book at a Time in its Original Context. The course was organized and led by Dr. Ernst Wendland and Dr. Lynell Zogbo. Fourteen Bible translation consultants from different parts of the world were accepted to the course. It was held at JCBT facilities at Yad HaShemonah, Judean Hills, between October 29 and November the 16, 2018. You can Read About Our Future Semester Program by Clicking Here. Who caused the founding of JCBT. program for 2019 CLICK HERE. Your prayers and your contributions will be a blessing to new nations.